There is almost nothing else in life more important. Without your health, does anything else really matter? No matter what we have, or hope to have, it can not be achieved or enjoyed without good health. What should you do to improve or maintain good health? S.M.A.R.T. is an acronym that describes the various attributes a health and fitness goal should have to ensure maximum probability of success. get Smart Fitness Personal Training® to teach you the best way to exercise and live a healthy lifestyle! SMART Fitness Personal Training® is a personal training service designed to develop and implement an individualized approach to exercise and fitness to those individuals with medical clearance to exercise. Using a variety of techniques, this service will help individuals perform safe and effective methods of exercise by applying the fundamental principles of exercise science --for the purpose of living a healthy lifestyle. SMART Fitness Personal Training® is owned and operated by Debra D. Williams, Ed.D. This is Debra now--fit and healthy. But at one time, she was 50 pounds overweight with high cholesterol and borderline high blood pressure. After discovering the benefits of hiring a personal trainer to customize exercises for her and recommend a steady fitness and healthy eating schedule, not only did she lose weight, her physical strength and overall well-being improved. In addition, Debra has kept her unhealthy weight off for more than 10 years and does not take any medication. She was so inspired by her personal training experience, she became a personal trainer! Now she helps others get healthier and maintain a healthy lifestyle. Are you looking for a little motivation to improve your health with weight loss, nutrition, and exercise? Look no further. Do you need to: start a fitness program, restart your fitness program, or rethink your fitness program and make it better than before...and get results? Hire Debra. SMART Fitness Personal Training is built on the foundation of Debra's personal experience and wedded to satisfying customer fitness needs. SMART Fitness Personal Training can provide adult exercisers the opportunity to work S.M.A.R.T. Debra keep's it simple with no gimmicks, tricks or hype. Her philosophy is, "You do the work; you’ll get results." get encouragement and support to meet those goals. She is an American College of Sports Medicine (ACSM) certified personal trainer with more than 15 years of personal and professional experience in the health and physical fitness industry. She is familiar with the different forms of exercise used to improve, maintain, and/or optimize health-related components of physical fitness and performance. As such, she is proficient in writing appropriate exercise recommendations, leading and demonstrating safe and effective methods of exercise, and motivating individuals to begin and continue with their healthy behaviors. 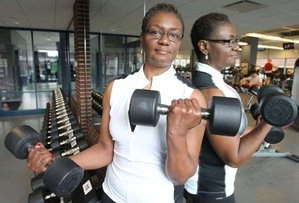 She is also a certified Spinning instructor and an Aerobics and Fitness Assoc. of America (AFAA) group fitness instructor. She is a licensed Zumba instructor, obtained a "small group" certificate to lead Kettlebell classes, and has taken workshops in nutrition and the foundations of a healthy diet and lifestyle.